Keith Crosby knows that a dog can take away loneliness and pain. 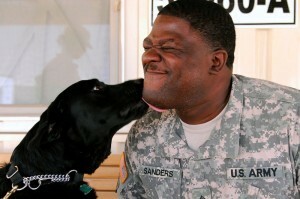 Having dogs around helped him when he came back from Vietnam with Post Traumatic Stress Disorder (PTSD). “I had PTSD for years, and just didn’t know what it was,” he explains. With his close friend, Gresford “Lewis” Lewishall, they formed Stay Strong Nation, a 501(c)(3) non-profit charitable organization, to help veterans with PTSD. Their goal is to construct a first-class treatment center for military personnel where therapy dogs will be a major component. While the Department of Veterans Affairs has expanded mental health counseling and services so that all returning service men and women have access to screening and treatment, Lewis, Keith, and the staff at Stay Strong Nation believe there is still a need to create a tranquil and revitalizing point of reentry for the troops. To raise awareness, Keith co-wrote the song Stay Strong. The song pays tribute to and inspires those who serve. There are two hip hop versions and a country music track. To raise funds for the center, Lewis and Keith are writing grants, raising funds from the song, and are touring the country with a 35 foot by 17 foot inflatable message board about PTSD. They recently brought their message to thousands of people in Times Square in New York City. Their next stop is Hawaii; after that they will be in Miami. To help Stay Strong Nation and for more information, click here.